You can't beat The System! 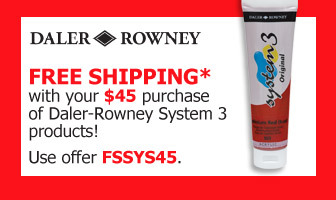 Daler-Rowney System 3 is a versatile water-based acrylic offering all the virtues of lightfastness, permanence, insolubility, and covering power in an economical, medium-bodied paint. System 3 is fast-drying and has a greater pigment load than other paints in its class. The 500 ml flip-top squeeze bottles are an economical choice for busy classrooms, murals, and theatrical scenery. The full range of 53 colors is available in 59 ml plastic tubes, including metallics, fluorescents, and process colors. Jumbo Set of 8 Colors — An exceptional value! This set contains eight 150 ml tubes of high-quality, highly pigmented, waterbased acrylic paint, including Titanium White, Ultramarine Blue, Cadmium Yellow, Cadmium Red, Yellow Ochre, Sap Green, Mars Black, and Burnt Umber. Process Set of 5 Colors — A set of 5, full size 75 ml (2.5 oz) tubes, including Process Cyan, Process Magenta, Process Yellow, Process Black, and Titanium White. Process colors are the 3 primary colors plus Black. In commercial printing, they combine to form a wide variety of secondary colors. 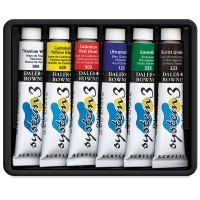 Selection Set of 8 Colors — A set of 8, full size 75 ml (2.5 oz) tubes, including Cadmium Yellow Hue, Cadmium Red Hue, Emerald, Ultramarine, Yellow Ochre, Burnt Umber, Mars Black, and Titanium White. 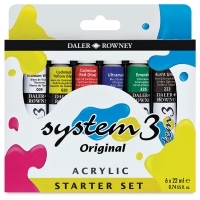 Starter Set of 6 — This great selection of 22 ml (0.75 oz) colors is a great way to get started with Daler-Rowney System 3 Acrylic. It includes Titanium White, Cadmium Yellow, Cadmium Red, Emerald, Ultramarine, and Burnt Umber. Introductory Set of 10 Colors — This set of 10, starter size 22 ml (0.75 oz) tubes includes Lemon Yellow, Cadmium Yellow Hue, Cadmium Red Hue, Crimson, Ultramarine, Emerald, Yellow Ochre, Burnt Umber, Mars Black, and Titanium White. 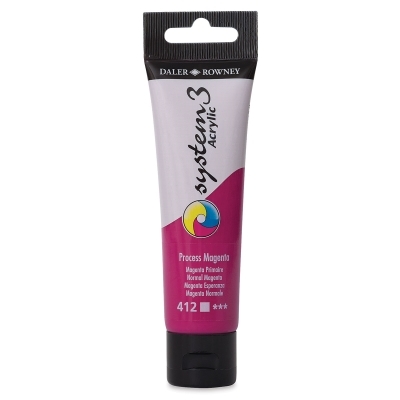 System 3 is a soft body acrylic that offers the covering power and lightfastness you would find in an artist quality paint. System 3D is an ultra thick acrylic that has an oil-like consistency and great peaking capabilities. See more about these affordable, quality paints in our video.